I think it's a wonderful thing to help others around the world, but since charity begins at home, and given the uneasy feeling I have about that forced payment plan, I will continue to support our local food bank with daily donations (7 items per week for years now and cash at Christmas). Good luck with your project as well. It's important to stress though, that this is not simply charity. It's a loan that is intended to be fully repaid. You could loan $100 and in about 6 months (Depending on the specific loan) you have a 97% chance you will get every penny back, which you could then add to your local food bank. Ok.. I KNOW we can get a few more people than 3 on the team. There are so many people to help out, like Shamama Feyzullayeva from Azerbaijan. Shamama Feyzullayeva is an enterprising woman. She is always happy to do good work. When she was young, she had a big desire for self-improvement. 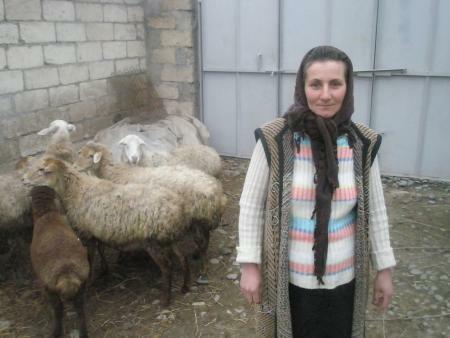 For about 10 years, she has been running a sheep-breeding business. This activity allows her to support her three children, who are the reason for her being. She has raised them with the help of her husband. Her three children are enrolled in school. Shamama lives with them and with her parents. For this reason, she wants to increase her investment capital to be able to keep supporting them. Shamama has recommended her as a client with a good loan history, so AqroInvest trusts her. With your support, she will be able to buy new animals. There are so many profiles and people to help. Team is now at 4. I've been meaning to do this for a while now. Woo hoo! 4 people on the team and $1300 loaned so far to 47 entrepreneurs. Mrs. Balkissou BAKO-YAYA was born in 1948 in Ghana, and has five (5) people in her care. Her husband, a retired chauffeur, is unable to contribute enough to the household expenses. With her small business selling okra, a highly valued vegetable, Mrs. BAKO-YAYA bears the responsibility of meeting the many family expenses. Not having enough financial means, she is asking for a loan to supply herself regularly with large quantities of okra. The income drawn from this business will allow her to take care of her family and thus improve their living conditions. We are one of the top lending teams for Mrs. Balkissou! This is a real profile of a real person that has received a direct loan from us to help them sell vegetables and earn for her family. It's such an amazing program, I'm really hoping more ehMac members will get involved! Update on ehMac.ca Kiva.org team! Just an update on our ehMac.ca Kiva.org team! - To date, we have 10 Members on the team! - We have made a total of 83 loans so far!! - We have loaned $6,100 in loans so far!!! - As of January, 2008, every loan I have given has been 100% repaid! I encourage more ehMac.ca members to get involved! Let's try to get to 20 members and $10,000 loaned by the end of the year! Join the ehMac.ca Kiva.org lending team today!!! Last edited by MazterCBlazter; Oct 13th, 2012 at 07:45 PM. Last edited by gordguide; Oct 2nd, 2009 at 04:24 PM. Please see bottom of my post here. Anymore posts about payment methods in this thread will be removed. Anyone is free to participate in the ehMac Kiva.org team.